As a sporty, outdoorsy type with a very nature-friendly name, I knew she'd appreciate us borrowing her identity for the evenin' and decking the place out a la Camp Willow. Here's a shot of the table during prep. The beauty of such a laid back theme is that it's easy to make it a pot luck without worrying about your mother showing up with her famous potato salad in what would usually be atrocious presentation... *ahem*.... Luckily, the little extra metal sheen worked out. Can you see the bags of "live bait" (jello and gummy "minnows") in the background, beside the can of worms? Can't ignore the fishin! Because I can't resist, here's a close up. 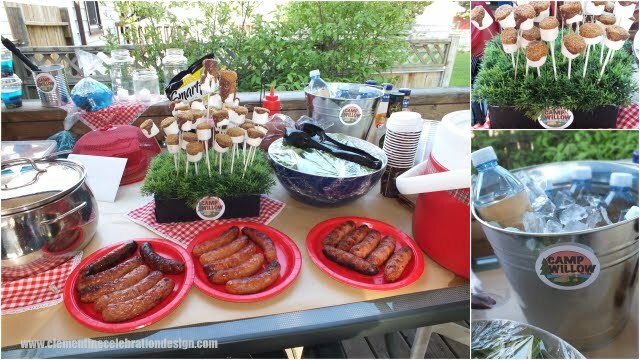 S'more pops for all! Laid out on a grassy turf. Just a peek at what went on at fireside. That ugly little cooler bag is protecting the delicious fixin's for s'mores and roasted hotdogs... yum! Further proof that you can't judge a book by its cover. 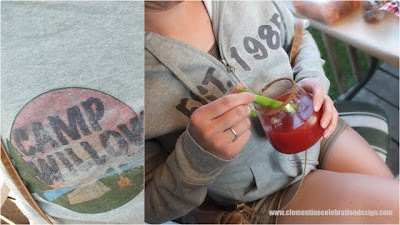 A custom vintage-look sweater for the birthday girl. 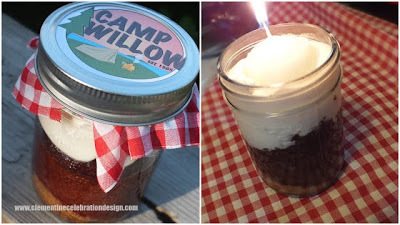 Instead of cake, guests were served s'more cake in a jar, adapted from this recipe. Instead of marshmallows, I made a marshmallow creme icing and piped it on. I hope you loved reliving that party as much as I did. I could seriously eat s'more pops every day!